Arizona National Golf Club resides in the stunning Santa Catalina Mountains. And the Coronado National Forest is a 4 iron away. The setting provides panoramic mountain views studded with giant saguaros. Arizona National Golf Course is a Robert Trent Jones Jr. design. The layout flows across the rugged natural terrain of the foothills. Mesquite-lined arroyos and rocky outcroppings narrow landing areas that can intimate any player. The course is challenging if not down right difficult based on the tees selected. Elevation changes and forced carries over desert expanses demand precision. Elevated tees and natural water hazards add to the difficulty. The finishing hole is one of the most memorable on the course. The tee box is 200 feet above the fairway. It is a photo opportunity if there ever was one. But a lake along the left side and trees on the right make it a tough finishing hole. Arizona National Golf Club was used U of A Wildcats Men’s and Women’s golf teams have designated it their home course for many years. A Wall of Fame honors former University of Arizona golfers and championship teams. The Wall near the 18th Green displays NCAA champions and professional players. The Champions Room features memorabilia from many of the current players. Championship trophies and golf bags are proudly displayed. Annika Sorenstam, Jim Furyk, Ricky Barnes and Ted Purdy are players from the U of A that have made their mark in the professional ranks. U of A continues to provide some of the brightest stars on the PGA, LPGA and Champion Tours. Visit the University of Arizona Wildcats Men’s and Women’s golf teams for more information on current events involving University of Arizona golfers. Considering A Home In Tucson, AZ? Are you thinking of buying a home in the greater Tucson area? Finding the right home can be a challenging process. But we can make the process much less stressful for you. We have been Tucson Realtors since 2002. We know Tucson and the Tucson Real Estate market. As a top Realtor duo, we invest the time to understand your home buying interests and desires. At our first meeting, we will review the current real estate market with you. Show you the market data and then walk you through the Arizona home buying process. 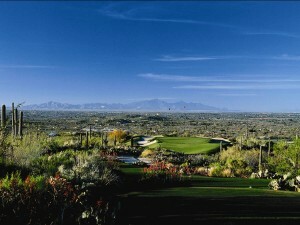 There are lots of great golf courses in Tucson, AZ. So if you are thinking of relocating to a place with great weather and sunny days consider Tucson. We are a top Realtor duo in Tucson, AZ since 2002. Read our client testimonials. Give us a call. We look forward to making your home buying or selling a home an enjoyable experience for YOU!